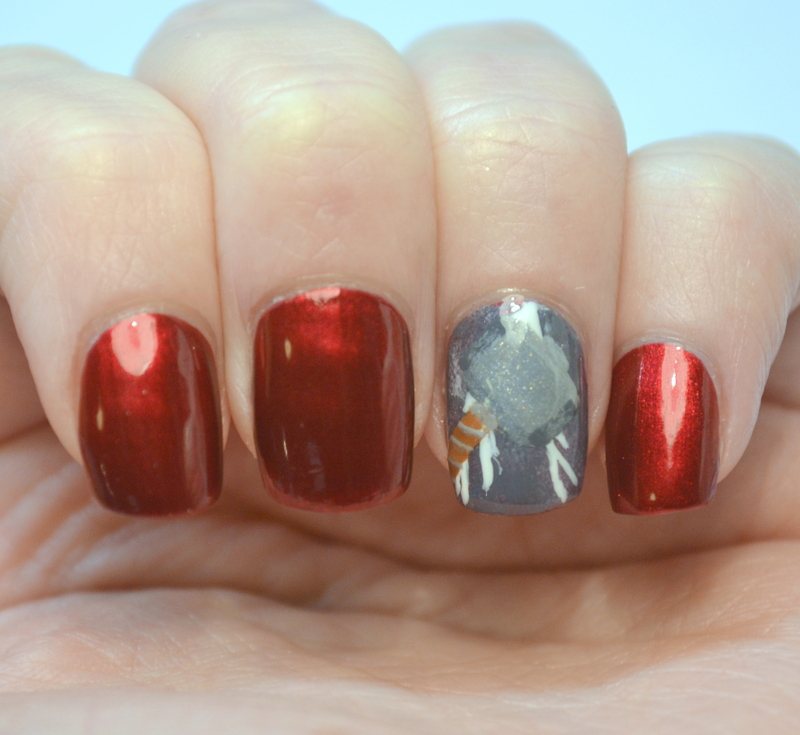 May 18, 2015 / Rachel C.
So if you didn’t get it from the title, I’ve got a mani inspired by Mjolnir today! For those of you who don’t care for comic books or superhero movies, Mjolnir is Thor’s hammer, which can only be wielded by those deemed worthy. I saw the new Avengers movie a little over a week ago, and I have to admit I liked the attention paid to Mjolnir and the concept of being ‘worthy’. 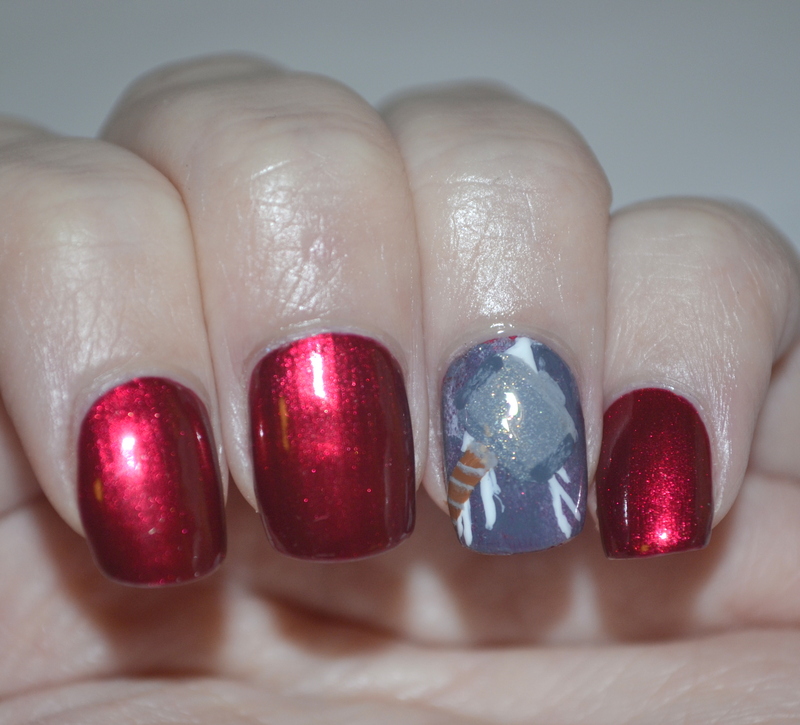 It wasn’t my favorite aspect of the movie (that role goes to the general sassiness of all of the characters, especially Hawkeye and Ultron), but it did stand out when I sat down and thought about doing Avengers nail art. I thought a-England Perceval looked like the color of Thor’s cape, so I used that as a base color. 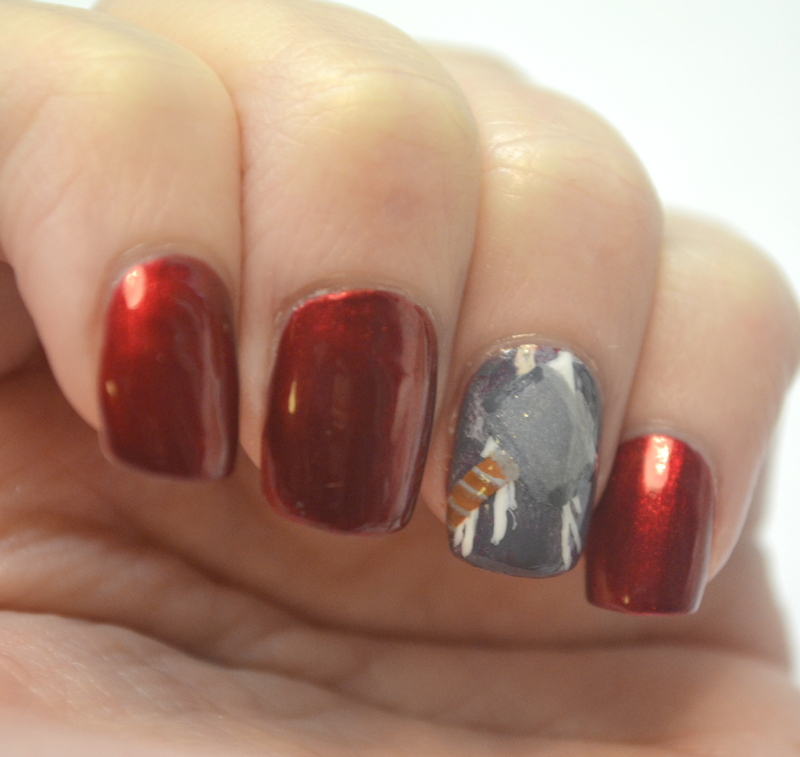 But then I decided that Mjolnir might not look good with that as a background, so I sponged on Essie Blanc and Kleancolor Concrete Gray for the accent nail, and did a bolt of lightning with Blanc too. 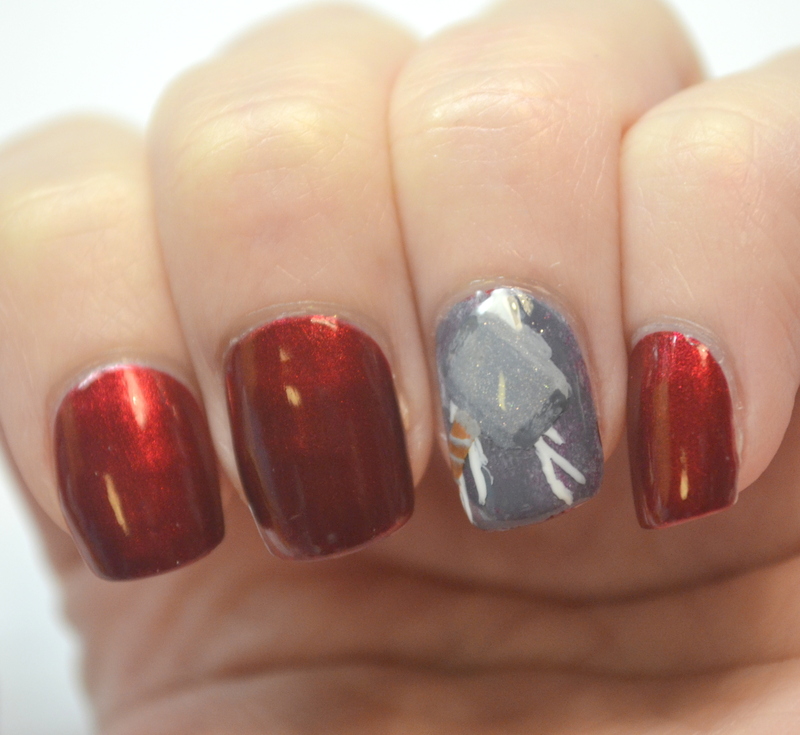 Mjolnir itself was made with Concrete Gray, OPI I Don’t Give a Rotterdam, Zoya Carey, and OPI A-Piers To Be Tan. I was worried that this wouldn’t turn out well, but I was actually really happy with the end result. I wish I had sponged the gray and white on the other nails instead of leaving Perceval, but it really doesn’t bother me because 1) I like Perceval, and 2) I like Mjolnir so much that I could have a neon yellow on my other nails and still be pleased with this mani. 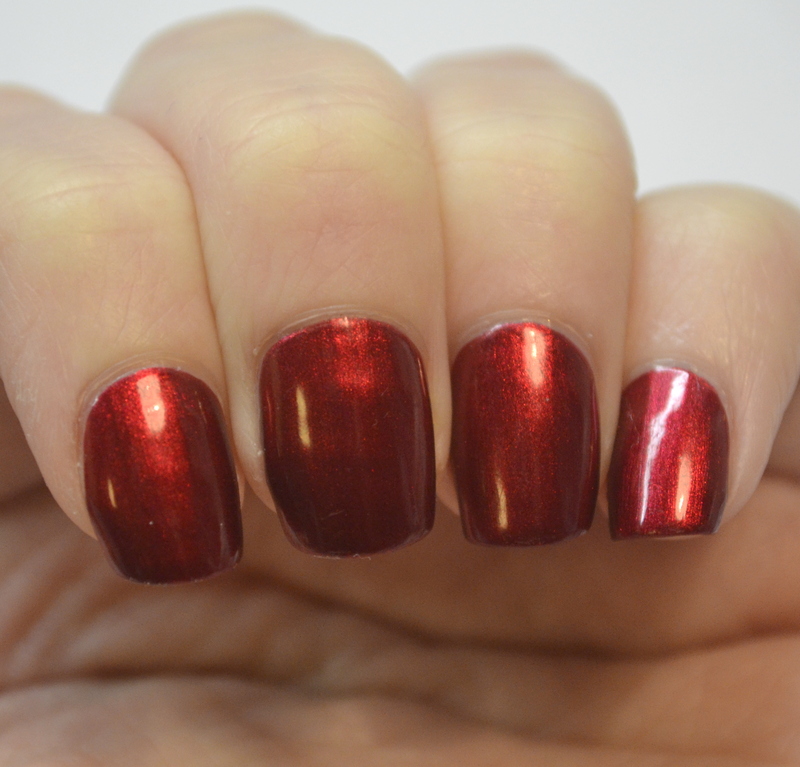 And, as per my normal habit, here are a few pictures of Perceval without the nail art. It was really streaky on the first coat and was still a little bit on the second but I thought it looked okay, which is saying something because I hate streaks. 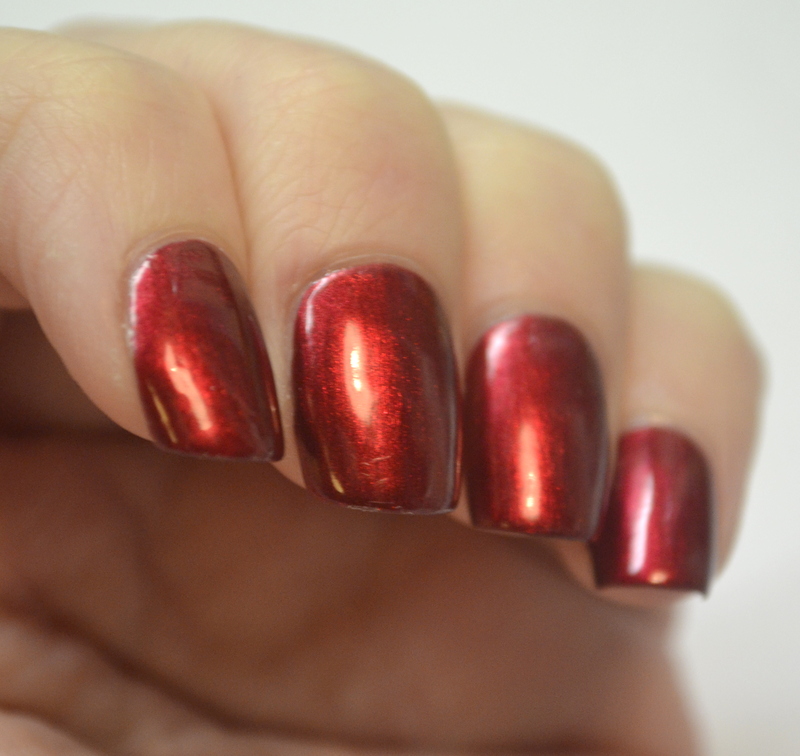 It’s why I generally avoid metallic and foil polishes. 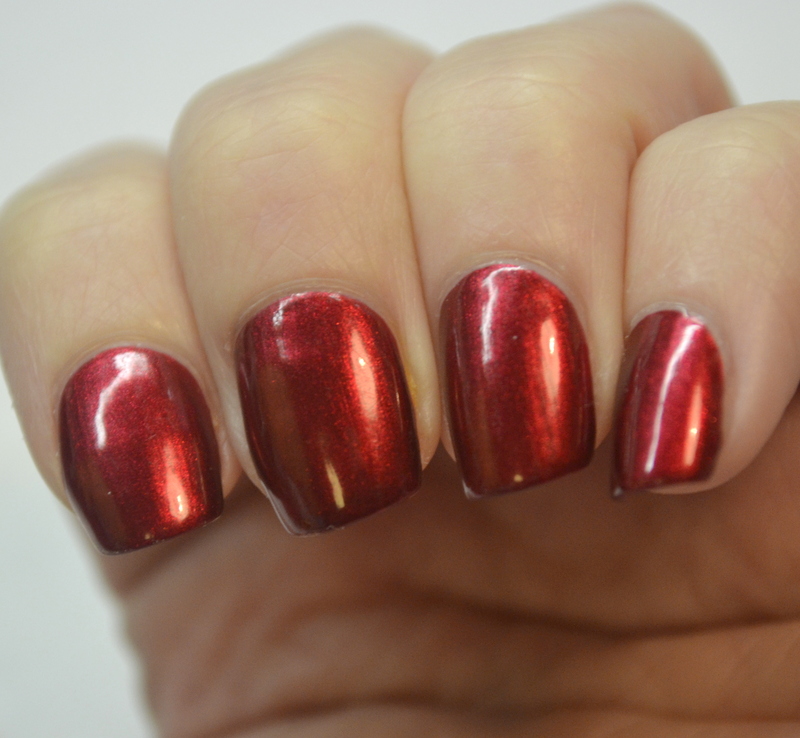 But Perceval was such a pretty red that I just couldn’t be bothered by them. It’s not an especially unique red, but it is a really well done one. So if you’re a fan of reds I would recommend it. By the way…my nerdy month sort of fell through, didn’t it? I’ve been busy, and before I knew it, it had been two weeks since my last post. I’m going to try and pick up my posts for the remainder of the month though, and may even carry the nerdiness over into June. I will be doing a few more nerdy posts, and hope to be able to turn my CYNA posts into nerdy ones this month too, so we’ll see how that goes. I think you did a great job, and that red polish is so freaking beautiful on you!